Tuesday December 29 1908 I was busy with the regular work all forenoon. I went down at 1.12 and did some errands before going out to Mrs Smiths It was such a mild pleasant day. There were a few ladies there and we had a nice social time. I came down down before six hoping to see Dr Smith but he had left the office. I came home at 6.38. I read in the evening. 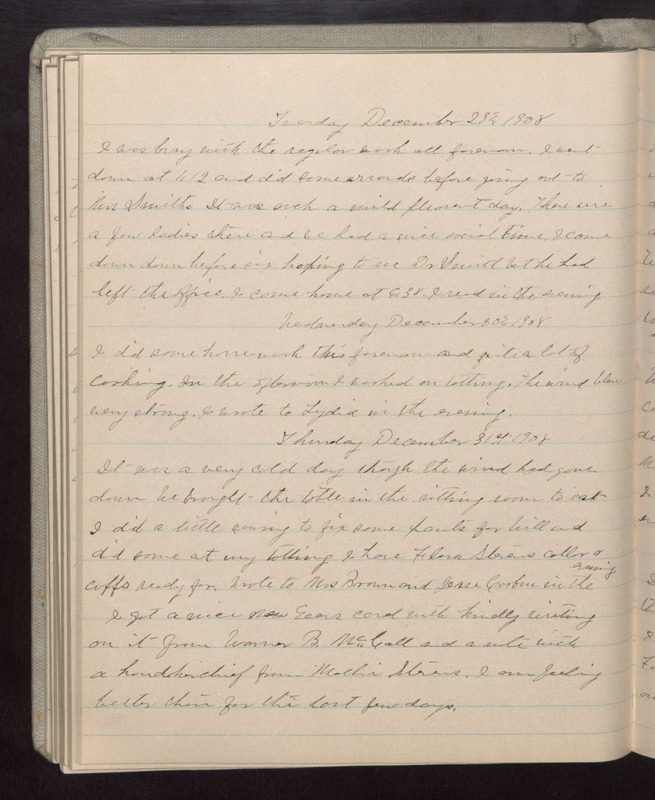 Wednesday December 30 1908 I did some house-work this forenoon and quite a lot of cooking. In the afternoon I worked on tatting. The wind blew very strong. I wrote to Lydia in the evening. Thursday December 31st 1908 It was a very cold day though the wind had gone down We brought the table in the sitting room to eat I did a little sewing to fix some pants for Will and did some at my tatting I have Flora Stevens collar & cuffs ready for Wrote to Mrs Brown and Jesse [Corfin?] in the evening I got a nice New Years card with kindly writing on it from Warner B. McCall and a [illegible] with a handkerchief from Mollie Stevens. I am feeling better than for the last few days.